We want you to feel good, confident and comfortable in your body and in your relationship with food. 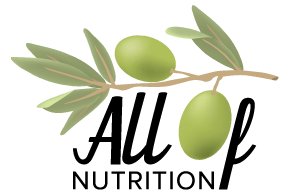 That’s why we’ve centered All of Nutrition around an olive branch. Why? The olive branch is a symbol of peace and victory. We want our clients to be at peace and feel victorious. By helping you achieve this, there are many aspects of your life we can help with: eating, exercise, grocery shopping, family meals, meal preparation and so much more. All in an effort to help you meet your goals and have it ALL. We want you to feel empowered to be healthy and achieve balance.